We’ve partnered with The Centre for Aging + Brain Health Innovation (CABHI) to offer the AICE-ABH program. This funding call aims to accelerate the evaluation and adoption of innovative products and services that address the needs of aging adults and the challenges presented by an aging population. 50 per cent of total project costs up to $250,000 per project (jointly provided by Alberta Innovates and CABHI. Minimum 25 per cent matching (cash or in-kind) must be provided by the SME. Maximum project term of 24 months. 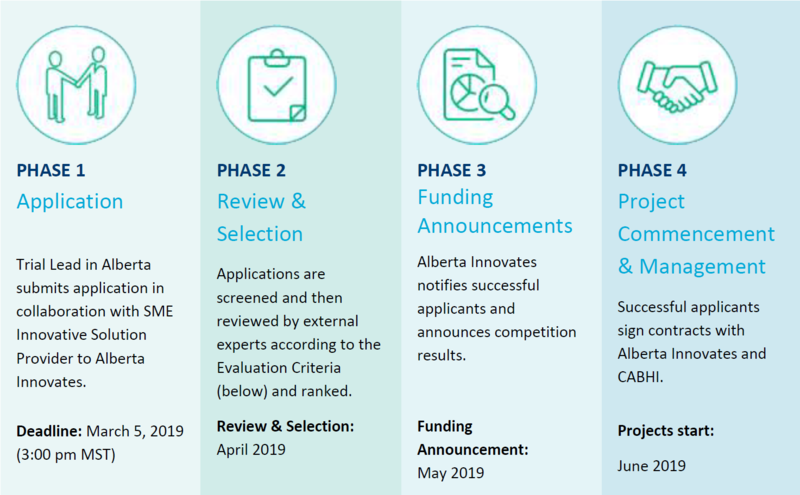 The program provides support to health care providers and researchers in Alberta to evaluate market ready innovative solutions built by small-medium sized enterprises (SMEs). Projects should generate the evidence required to support and accelerate the adoption of new innovative solutions that address challenges associated with aging and brain health, including dementia and other neurodegenerative diseases. Projects must focus on evaluating the impact of the innovative solution in seniors’ care settings, have a clearly articulated plan for commercialization and market entry and an intent and line of sight to spread and scale across the health system. Note: Local programs or projects in one zone or one hospital that are not generalizable to other zones, hospitals, clinics or sectors will NOT be considered eligible. Project activities cannot involve basic research, primarily academic goals, capital investment in a portfolio of intellectual property, pharmaceutical clinical trials or incubators for start-ups. More detailed information on the background, objectives, eligibility and review process can be found in the AICE-ABH Program Guide. Please complete the application form and submit it online through our online application portal by March 5, 2019 3:00 p.m. MST. Alberta SPOR SUPPORT Unit (AbSPORU) – Support researchers conducting patient-centered research by providing access to experts and knowledge in seven core areas of expertise. Alberta Clinical Research Roadmap – an interactive online navigator outlining the steps to setting up and conducting a clinical health research study within Alberta. ARECCI helps practitioners, agencies and organizations identify and mitigate ethical risks in program evaluations, quality improvement projects, needs assessments, health innovations and knowledge translation.